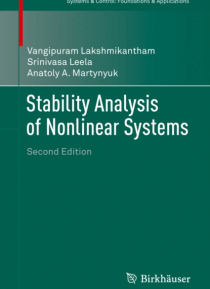 The book investigates stability theory in terms of two different measure, exhibiting the advantage of employing families of Lyapunov functions and treats the theory of a variety of inequalities, clearly bringing out the underlying theme. It also demonstrates manifestations of the general Lyapunov method, showing how this technique can be adapted to various apparently diverse nonlinear problems. Fu… rthermore it discusses the application of theoretical results to several different models chosen from real world phenomena, furnishing data that is particularly relevant for practitioners.Stability Analysis of Nonlinear Systems is an invaluable single-sourse reference for industrial and applied mathematicians, statisticians, engineers, researchers in the applied sciences, and graduate students studying differential equations.